I’m always amazed by the release schedule of Bob Dylan’s early career. As somebody who is used to waiting three or four years between my favorite artists’ albums, I can’t even fathom what it must have been like to have a new Dylan release available every six months or so. And not just new releases, but new releases containing his best material. I already documented that 18-month span that saw the release of Bringing it all Back Home, Highway 61 Revisited and Blonde on Blonde. And this weekend I’m writing about the second in another trilogy of spectacular albums, these released within a 12-month period. To be fair, The Basement Tapes were released in June of 1975, just five months after Blood on the Tracks, but they were recorded eight years earlier, in 1967, following Dylan’s motorcycle wreck. This was the period between Blonde on Blonde and John Wesley Harding, when Dylan’s music changed along with his public perception. No longer was he the brash poet with an attitude who’d gone electric and poured his fever dreams into epic explosions of lyrical and musical ingenuity. He was suddenly a recluse recording rootsy bar-band tunes and country folk songs. He teamed up with The Band and recorded a bunch of new songs that were promptly shelved. Some of these tracks, which Dylan described as “homespun ballads,” were recorded and released by others, including Peter, Paul & Mary and The Byrds. 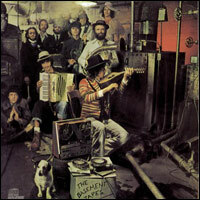 In 1975, those tracks were finally released, packaged in a double-disc set with a batch of songs by The Band and called The Basement Tapes. The Band’s Robbie Robertson compiled the tracks (which covered only a fraction of the recordings from those early sessions) and overdubbed new instrumentation onto most of them. I’ll spend some time on the songs themselves in tomorrow’s entry. Today, I’ll just highlight one of them — ‘Please Mrs Henry,’ a splendid example of the sort of drunken absurdity you’ll find on The Basement Tapes. An’ pump me a few? This entry was posted in dylan weekends and tagged Bob Dylan, Please Mrs Henry, The Basement Tapes. As familiar as I am with Blood on the Tracks and Desire, I really don’t know today’s album or song. Guess I’ll have to do some exploring on the IPod. Then you have a genuine treat in store Dana. I’m quite envious of anyone who gets to hear these songs for the first time. But the released Basement Tapes is only a small part of the treasure. Download the complete 4-cd version, A Tree With Roots, if you can (try the expectingrain.com forums). About 100 songs, and a musical feast and journey through American music quite unlike anything else.